Gypsum-fiber sheets (GVL) and gypsum-cardboard sheets (GCR) are widely used today both for leveling walls, and for finishing and creating partitions inside rooms. Materials have common advantages - this is an easy installation and processing process, the possibility of leveling any surfaces, the permissibility of using any decorative compositions and coatings, as well as an affordable price. However, between them there are serious differences that determine the characteristics of the use of plates for repairs. A detailed comparison of the characteristics and characteristics of each material will make it possible to understand what is better - gypsum fiber or gypsum cardboard - with one or another type of work. 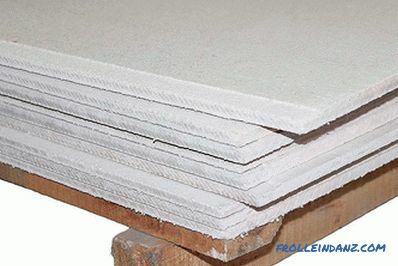 The gypsum plasterboard is a very simple structure - a kind of thick cardboard sandwich, between which a gypsum mixture is laid with special additives for increase the strength. This design provides the material lightness, environmental friendliness, relatively high bending strength and thermal insulation properties. To improve the quality characteristics of a gypsum board, various components can be added to its composition. 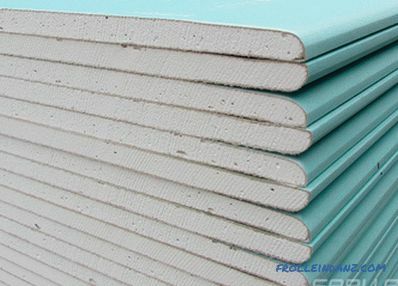 Conventional plasterboard sheets (GCR) . Differ in gray cardboard with blue markings. Used for finishing work in rooms with high and normal humidity. 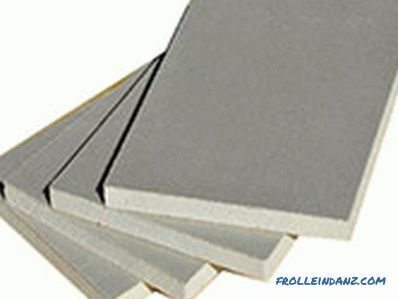 Moisture-resistant plasterboard (GKLV). Drywall treated with a special impregnation, while antifungal compounds and hydro-protective agents are added to the gypsum mixture itself, can not only absorb 10 times less moisture than regular gypsum plasterboards, but also quickly removes moisture that has ingested. Sheets of such drywall are green on both sides, marking is put in blue. 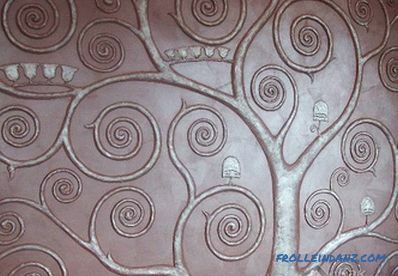 Fireproof plasterboard (GKLO). To increase the open flame resistance, gypsum plasterboard sheets are impregnated with special flame retardants and, in some cases, are added to the gypsum "stuffing" of the sheet in a special way crystallized water. Such additives inform the material of high heat resistance - the limit of sheet resistance to open fire can be up to 60 minutes. Sheets GKLO have pink color, marking - bright red. Moisture-resistant plasterboard with increased resistance to fire (GKLVO). Special water-repellent components and flame retardants allow the material to combine hydro-protective properties with the ability to withstand the effects of a flame for a long time. Sheets are green with red markings. Attention! Externally, the plates of GKLV and GKLVO differ from each other only in marking, so when buying, it is worth making sure that you choose the right material! Difference between gypsum fiber and gypsum board lies in the composition of the materials. GVL plate consists of a homogeneous mixture of loose cellulose fibers with gypsum, which is pressed according to a special technology, reinforced with fiberglass if necessary, and then cut and polished to a smooth surface. The composition provides the material with increased density and improved performance. By itself, gypsum fiber is highly fire resistant - the structure of GVL plates eliminates any possibility of ignition. 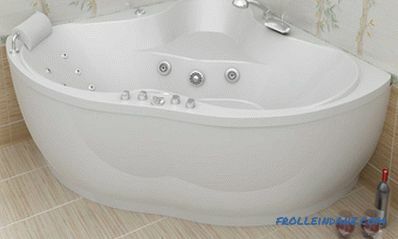 Therefore, the material is available in two forms - normal and moisture resistant. GVL sheets have gray color and blue marking with indication of the type of material (normal or moisture resistant) and dimensions on the back side. The rationality of the use of gypsum gypsum plasterboard and gypsum plasterboard is determined by the characteristics and performance characteristics of materials. Knowing how gypsum fiber differs from gypsum board by its basic parameters, one can determine how sensible it is to use one or another variant during repair work. The density of the gypsum plasterboard regardless of the hydroprotective and thermal protective components is approximately 850 kg / m 2 . By this parameter, gypsum fiber significantly exceeds gypsum board - its average density indicator is 1200 kg / m 2 , which is equivalent to claydite concrete. Due to the homogeneous and dense structure, nails can be driven into a sheet of gypsum fiber board and screws can be screwed in without using dowels, as is the case with drywall. At the same time, hardware installed in the GVL can withstand a 30-kilogram load hung on them. Gypsum-fiber sheets are more durable than drywall. This is achieved primarily due to the higher density GVL. This determines the scope of these materials. Gypsum board sheets are used for lining light structures - partitions, suspended ceilings, wall cladding at home.Gypsum-fiber sheets have increased strength, which allows them to be used in industrial facilities and in premises where higher loads can be applied to walls. GVL bending strength is more than 5.5 MPa, gypsum plating does not reach this value. When wetting gypsum plasterboards, they soften somewhat and acquire a certain flexibility, which allows making arches, shaped ceilings and radius structures for interior decoration. Gypsum fiber plates are distinguished by unchangeable rigidity, it is almost impossible to bend them without breaking, and therefore they are used exclusively for finishing and building linear structures. 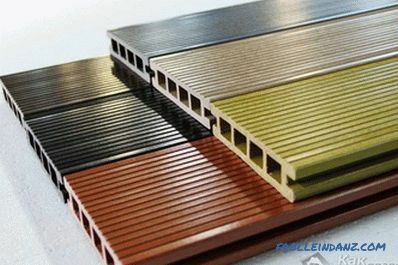 Device of Partitions On a metal or wooden frame according to the technology common for plaster products. On a metal or wooden frame according to the technology common for gypsum products. Cutting You can cut with a knife, cutting the top layer of cardboard and breaking the gypsum core. Cannot be cut with a knife, sawing is necessary. Fastening using TN or TB screws, as usual, for plaster products, technology. TN screws, in the usual way, for gypsum products, technology. Processing of seams Each seam must be covered with reinforcing tape, followed by a special mixture of putty. The use of reinforcing tape and preliminary putty at the joints is not required. 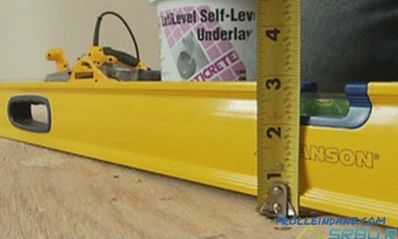 Processing of corners (internal and external) To create a perfect internal corner, reinforcing tape is required, and for external corners, special metal corners. Does not require the use of special angles and nets. Surface treatment before painting Apply a layer of putty followed by priming. It is possible to putty only joints of sheets and subsequent priming. Painting The use of paints and whitewash on silicon base is unacceptable. It is possible to use any whitewashing and coloring compositions. Preparing for pasting wallpaper Apply a primer for wallpaper. When removing the wallpaper is high risk of damaging the surface of the plasterboard. Primer is optional. The surface of the GCR preserves its integrity even after the removal of the wallpaper. In this case, it is extremely difficult to determine which is GFL or drywall. Both materials are environmentally friendly and do not contain toxic components. Drywall has a certain heat resistance - even a regular sheet is able to withstand about 25 minutes of open fire before the onset of destruction, while the cardboard surface is charred. Some manufacturers use special flame retardants for the impregnation of sheets, so that the fire resistance of the gypsum board increases to 60 minutes. The composition of gypsum fiber eliminates any possibility of fire, and therefore it is safer. However, both of these materials are classified as flammability group G1. 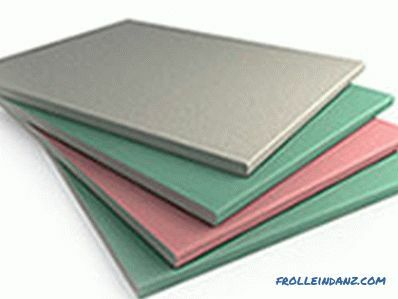 The standard size of a gypsum-fiber sheet is 2500x1200 mm. Such a sheet, depending on the thickness can weigh from 39 to 42 kg. 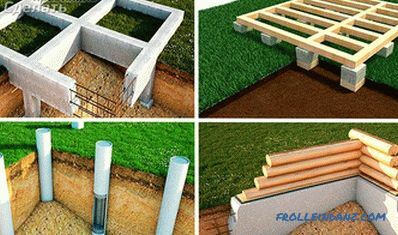 Drywall is much easier - the weight of the slab of the same size of the greatest thickness is 33 kg, which makes carrying and working with the material somewhat easier, and the weight of the manufactured structures is less. Differences in the characteristics of the gypsum board and gypsum fiber board make you think about material is better to use when repairing. The choice will depend on the type of finishing work and the characteristics of the specific room. 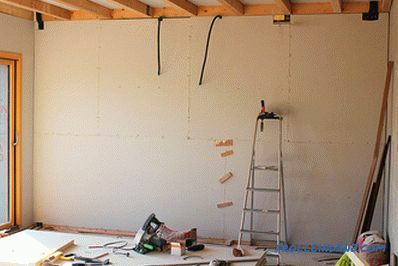 When deciding what to choose - drywall or gypsum plasterboard walls - you should focus on the degree of load on the wall, the complexity of the design and the microclimate in the room. In the apartments and residential buildings it is acceptable to use the usual, and in the bathrooms - moisture resistant plasterboard. It is much easier to work with, and quite capable of withstanding such intensity of operation. Gypsum-fiber sheets are suitable for wall cladding in industrial facilities, in places with high humidity, as well as in rooms where high mechanical loads are provided - for example, fastening heavy equipment. The use of drywall to hem the ceiling allows you to create complex structures and curved elements. When using gypsum sheets, the entire structure will have a significantly greater weight. 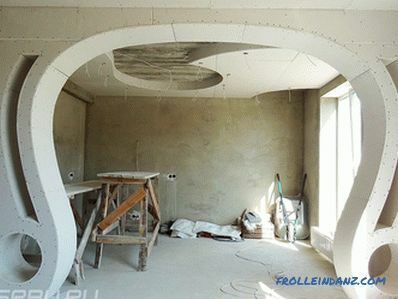 At the same time there is no possibility to make curved elements, and the process of ceiling finishing is more complicated. But in the case of GFL for ceiling filing, you can get much better noise insulation and protection from steam penetration. 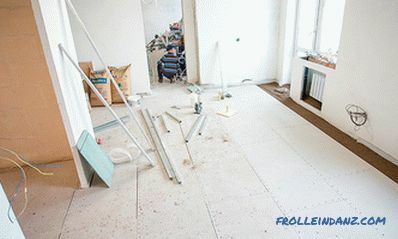 Only gypsum-fiber boards can be used for leveling the floor under the floor covering - the rigidity of the material and its high bending strength and compression provide it with resistance to serious loads. GKL indicators for these parameters are much lower, they are more fragile, and therefore are not used for flooring. It is quite possible to use drywall for small, well-heated bathrooms. However, if you need a durable and reliable finish, which is not afraid of high humidity, the advantage will be on the side of gypsum-fiber sheets. The expansion coefficient of GVL does not exceed 1.5%, so the joints remain smooth and tight, even with prolonged exposure to moisture. Plasterboard and gypsum fiber have a lot in common - both materials are eco-friendly, accessible and quite simple to install. However, when planning repairs, it is worth considering the plasticity and lightness of the gypsum board and the high mechanical strength, density and fire resistance of the gypsum plasterboard - and when choosing to focus on the characteristics of the room and the ultimate goal of finishing works.